A beautiful diamond-cut filigree open heart pendant crafted in 14k yellow gold. Heart measures approx. 7/8" wide x over 3/4" tall (1 1/8" tall with hoop). 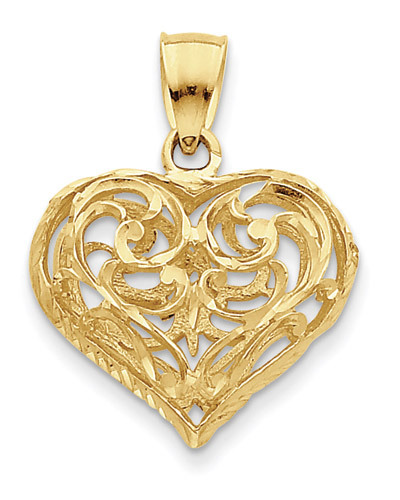 See our collection of quality gold heart pendants. The graceful curves of the designs that adorn this 14K gold filigree heart pendant create a look that communicates affection with a big dose of feminine charm. Both sides of a three-dimensional heart are covered in these curling openwork motifs, allowing both sides of this lovely 14K yellow gold piece to be seen at once as it hangs from a gleaming bale. This unique heart pendant measures 7/8" wide and 1 1/8" high, making it a sophisticated statement of both love and style. We guarantee our 14K Gold Filigree Heart Pendant to be high quality, authentic jewelry, as described above.